You are currently browsing the category archive for the ‘Polls’ category. Three weeks after his election as president, the public’s confidence in Barack Obama remains “remarkably consistent” and “doesn’t yet appear to be have been affected, positively or negatively, by news coverage of the president-elect’s staff and Cabinet appointments, or by reports of his economic and other policy plans,” Gallup reports this morning. The polling firm’s daily tracking poll now shows 65% of those surveyed say they’re confident in the Democratic president-elect’s ability to be a good president. The figure has stayed between 63% and 67% since Election Day. Margin of error: +/- 3 percentage points. A new poll out Thursday paints a bleak picture for the GOP. WASHINGTON (CNN) – The Republican Party has hit a new low. The poll of national adults was conducted on November 13-16 with a three percent margin of error. The numbers are slightly up from a CNN poll released last week that indicated a 54 percent unfavorable rating for Republicans. Only 38 percent of those polled had a favorable rating for the party. Meanwhile, Democrats continue to bask in the glow of President-elect Barack Obama’s historic victory on November 4. The Gallup poll suggests that 55 percent of Americans hold a favorable opinion of the Democratic Party, with 39 percent saying they have an unfavorable view. Those numbers are mostly unchanged from a mid-October survey. As the debate rages within GOP ranks over where to take the party, the poll might offer some guidance. Most Republicans — 59 percent — want the party to become more conservative, according to the poll. Another 28 percent want it to remain about the same ideologically, while only 12 percent would prefer to see the Republican Party become less conservative. Independents are split on whether the party should track left or right: 35 percent of independent voters say the GOP should become more conservative, and 35 percent say less conservative. His focused effort to target a group that had heavily favored Republicans paid off, an exit poll shows. As he vaulted into national acclaim with his 2004 Democratic convention speech, Barack Obama directly took on the assumption that his party should cede religious voters to the Republicans. “We worship an awesome God in the blue states,” he said, pointedly adopting words from a song familiar to churchgoers, particularly younger ones. The four-year effort by Obama, who is Christian, to narrow the gap between Democratic and Republican support among religious voters paid off last week when he won the race for the White House. Exit polls showed the dramatic effect: Obama won 43% of voters who said they attend church weekly, eight percentage points higher than 2004 Democratic nominee John F. Kerry. Among occasional worshipers, Obama won 57%, 11 percentage points higher than Kerry, according to the National Election Pool exit survey. When looking at how members of different faiths voted, the movement among Catholics is striking. They sided 52% to 47% with President Bush in 2004. But this year, they went 54% to 45% for Obama. That means Obama had more support among Catholics than did Kerry, himself a Catholic, by seven percentage points. “Obama did better than Kerry among pretty much every religious group,” said Greg Smith, a research fellow at the Pew Forum on Religion & Public Life who analyzed the poll results. Even among voters who describe themselves as born-again Christians or evangelicals, a group that tends to vote Republican, Obama improved on Kerry’s standing — although he came in a distant second to GOP nominee John McCain. Kerry had won 21% of evangelical voters; Obama won 26%. The shift by religious voters may have resulted partly from changes in the electorate — voter participation by blacks and Latinos grew, and both groups tend to be regular churchgoers. Yet there is no doubt that secular voters were more supportive of Obama than religious ones, according to the exit poll. The Obama campaign, however, made sure to court religious voters and took advantage of his connections to influential Christian leaders. Obama again gained the attention of Christian voters in July when he pledged to expand a controversial White House program to give federal grants to churches and small community groups. The proposal, which would build on efforts by the Bush administration to direct government money to church groups, was announced in Zanesville, Ohio, a hotly contested state that Obama won on election day. And at the Democratic National Convention in August, which held its first-ever interfaith prayer gathering, the party platform endorsed by Obama — while not backing away from its support for abortion rights — emphatically reached out to women with children who rely on programs meant to ease their struggle. Obama’s ease in talking about his religion also helped him win over religious voters. During a presidential forum held in August at Saddleback Church, where he and McCain were interviewed separately by church leader Warren, Obama spoke about “walking humbly with our God” and quoted from the Gospel of Matthew. His acceptance speech Tuesday night echoed in parts the church-inspired speeches of the Rev. Martin Luther King Jr.
“He uses the faith language very well,” said Clyde Wilcox, a Georgetown University professor of government who has studied the subject. And that, he said, inspired trust. Religion, for a time, became a thorn for Obama during the presidential race. He was harshly criticized for his association with the now-retired Rev. Jeremiah A. Wright Jr., whose incendiary sermons about white America caused an uproar and led Obama to part ways with his longtime pastor, and endured a viral e-mail campaign falsely asserting that he is Muslim. The Obama campaign reached out to evangelicals and other religious communities, aware of the opportunity to peel away some voters. Douglas W. Kmiec, a Pepperdine law professor, caused a stir last spring when he publicly endorsed Obama. One month later, at a Catholic Mass to which he was invited, Kmiec was denounced from the pulpit and denied communion because of his endorsement. Kmiec said that although Obama’s support for abortion rights contradicts official Catholic doctrine, his broader approach aligns well with the church’s beliefs on issues such as the economy, healthcare and the environment. “I was attracted out of my Republican-ness to Sen. Obama’s side largely because I could hear, in the way he was articulating economic issues and social issues, the social gospel of the Catholic Church,” Kmiec said. From September through election day, Kmiec traveled to key states including Indiana, Ohio and Pennsylvania, meeting with groups of people at churches on Obama’s behalf. The election’s focus on the economy was “providential,” Kmiec said. Without the usual single-issue debate about abortion rights among Christian voters, the Obama campaign had the opportunity to make its case on other fronts. “It moderated, it seemed to me, the amount of time that was devoted to these divisive conversations,” he said. The election results returned Catholics to their historical Democratic moorings, which many had fled for the GOP during the Reagan years. “That is opening a door that had been closed for a while,” Kmiec said. But whether it stays open may be determined by whether Obama’s actions match what he promised — and also by what larger political environment defines the 2012 presidential race. “At some level, if he’s a good president, that will affect evangelicals and non-evangelicals, Catholics,” said Wilcox of Georgetown University. It is too soon, he said, to know whether Obama’s improvements among religious voters indicate a new alignment for Democrats, or were simply a verdict on the 2008 candidates. “I would want to see this over time,” Wilcox said. Democratic Rep. Tom Udall won the New Mexico seat that had been held by Republican Pete Domenici, further bolstering Democratic fortunes in the Senate, wire services reported. Pennsylvania and New Hampshire, the only blue states that John McCain was targeting in the final week of the campaign have gone for Barack Obama, according to the exit poll consortium tasked with calling races for the television networks and major newspapers. The Keystone State has long been coveted by Republicans who liked to point out in the runup to today’s vote that their party had closed the gap at the presidential level in each of the last four presidential elections. The Obama campaign has remained resolutely confident about its Pennsylvania prospects, insisting that the massive surge in Democratic voter registration — the result of a high-profile presidential primary in the state — had made it nearly impossible for McCain to win. As the county by county results trickle in, watch to see how big a margin Obama takes out of the city of Philadelphia as well as the four suburban counties that ring the City of Brotherly Love. New Hampshire had long expressed a warmth for McCain, launching his presidential bid during the 2000 primary season and saving it in the 2008 campaign. But, New Hampshire was the epicenter of anti-war (and anti-Bush Administration) sentiment in 2006 and in the closing weeks of this campaign even the most ardent McCain supporters had acknowledged the state would not go there way. With Pennsylvania and New Hampshire now seemingly off the map, McCain must run a tricky gauntlet — winning a handful of states that Bush carried in 2004 but are closely contested this time around. Make no mistake: McCain now has almost zero margin for error. Even though every political and statistical indication points to an Obama victory tonight — and a healthy one at that — a certain brand of liberal paranoia persists. This is too good to be true, Democrats declare, fingers grasping at their hair. McCain is tightening the race in key states. The youth vote won’t come out. But if in fact McCain were to win this election it would be, one of the nation’s foremost pollster says, almost historically unprecedented. Indeed, the last time that Gallup’s final poll before the election did not accurately determine the winning candidate was 1948, when they stopped polling a week before Harry Truman’s comeback victory against Thomas Dewey. Even in 1980, when Ronald Reagan staged a late comeback that turned into an electoral rout, Gallup caught glimmers of this trend just in time, showing the Gipper up three points in its last poll. When it comes to the current election, the firm has Obama up eleven points in its final survey. But what should make Democrats more assured, said Newport, is that the Illinois Democrat has maintained a steady margin throughout the past month. Moreover, other polling firms are documenting similar trends — a confluence of data that validates the larger picture. 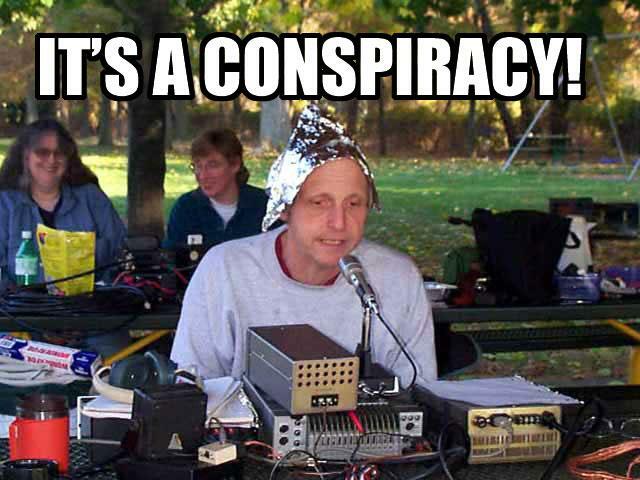 There are, of course, Obama supporters who will remain unconvinced. And as evidence they could cite the polls leading up to the New Hampshire primary, which showed the Illinois Democrat in a similarly comfortable lead only to lose to Hillary Clinton by two points. Newport acknowledged that the primary fight in the Granite State gives him and others in the business pause — he has yet to find a smoking gun to explain what happened, though he hinted that massive late-stage change in voter preference moved too quickly for polls to pick up. But that was, for better or worse, an aberration. Pressed to quantify just how big a failure for the polling industry a McCain victory would represent, he didn’t feel comfortable even following the hypothetical. Hoping to beat the rush, voters flocked to the polls early this morning only to find parking lots already packed, turnout high and long lines already snaking around the block as scattered voting problems were reported in Virginia, Pennsylvania and Ohio. In Virginia, reported problems were widespread, according to reports gathered by the Election Protection Coalition, a cooperative effort by more than dozen voting rights groups. Voters said they encountered broken touch-screen machines and paper jams in the scanners that are supposed to read the ballots at polling places in Richmond, Alexandria, Newport News, Chesapeake, and Vienna. Polling places in Virginia Beach were not opened at 6 a.m. when they were supposed to be. “They harangue us to vote and then they don’t have the capacity to handle us when we show up,” said a man standing with a cane in a two-hour line in Fairfax, Va.
Virginia election officials said three polling places opened late because of what she called “human error.” In some cases, voters came in from the rain and failed to properly dry their hands before touching their ballots, fouling the optical scanning machines. In Pittsburgh, Pa., some lines were stretching several hundred voters long by 7 a.m. In Philadelphia, lines were equally long and at one polling place on in the east side of the city several voting machines were not working because there was no extension cord available to help them reach the electrical outlet. Despite the scattered problems, most people held on, steadfast in their passion to vote, undeterred by rain, sore feet or the long waits. Voting experts predicted a record turnout of 130 million voters, which would be the highest percentage turnout in a century. It could shatter the previous record of 123.5 million who cast ballots four years ago. If 64 percent of registered voters make their way to the polls, as some predict, it would be the highest percentage since 1908. Florida Secretary of State Kurt A. Browning said the 1992 record of 83 percent turnout could be surpassed in his state. Pennsylvania officials believe as many as 80 percent of the state 8.75 million votes will show up at the polls, a record. Lines and other problems began well before Election Day. By Monday night, Election Protection Coalition received calls about more than 700 early voters in West Creek Community Center in Kansas City, who waited more than eight hours to cast their ballots. Lines for early voters in Atlanta left people waiting for nearly ten hours. There were also reports of underhanded tactics. Several callers from Indiana, Pennsylvania, Virginia and Maryland reported receiving automated phone calls with incorrect polling locations. Dozens of people in Colorado and New Jersey reported not receiving confirmation of their voter registrations or absentee ballots. Yesterday alone, the hotline received more than 30,000 calls. Most were from voters in high population and swing states, including over 2,000 calls from Florida. The most common calls by far up until Election Day have been in regard to registration problems, followed by absentee ballot issues and polling place problems, which include extremely long lines. Note: Video the Vote is a network of citizen journalists, independent filmmakers, and media professionals documenting voter problems at the polls. We will be posting links from them throughout the day. In 14 national polls completed over the weekend, Barack Obama surpassed the 50-percent threshold in all but one, suggesting he is within striking distance of a feat no Democrat has accomplished since Jimmy Carter in 1976: winning a majority of the vote. The one notable and slight outlier is IBD/TIPP; it estimates Obama’s likely margin at 48 to 43 percent. Two of those pre-election national polls, which project the undecided vote, show Obama in a particularly commanding position. Gallup reports Obama winning 55 to 44 percent, while the Pew Research Center has him winning 52 to 46 percent. Presidential elections, of course, are not national contests. Rather, the president is selected in 50 different state elections. Here is how the final polls look in 14 of the most competitive battlegrounds. An Arizona State University poll (Oct. 23-26) had McCain’s lead cut within the margin of error early last week, at 46 to 44 percent. About a month earlier, the poll had McCain leading by 7 points. In the summer, McCain was leading by double-digits in the same survey. Polls completed Oct. 28 by NBC News/Mason-Dixon and CNN/Time had McCain ahead by 4 and 7 points, respectively. However, a poll completed Friday by Research 2000 measured the race as effectively tied, with McCain on top 48 to 47 percent. The most recent poll, conducted by FOX News/Rasmussen on Sunday, showed Obama ahead by 4 points, 51 to 47 percent—the survey’s same margin as one week earlier. The Denver Post/Mason-Dixon poll completed Friday and Saturday shows Obama ahead by 5 points, 49 to 44. SurveyUSA’s final poll, completed Monday night, had Obama ahead 50 to 47 percent. The latest Reuters/Zogby poll, completed Sunday, shows Obama leading 48 to 46 percent— a statistical tie, as the poll showed one week earlier. Surveys by Quinnipiac University and Public Policy Polling, completed the same day, show the same 2-point margin. But in Sunday’s FOX News/Rasmussen poll McCain was up 50 to 49 percent, also a dead heat. One week ago, the FOX poll had McCain trailing by 4 points. Two polls completed over the weekend, by InsiderAdvantage/Poll Position and SurveyUSA, show widely varying margins. InAdvantage/Poll Position reported a statistical tie but SurveyUSA showed McCain ahead by 7 points. Strategic Vision’s most recent survey, completed Sunday shows the margin right in between, with McCain leading 50 to 46 percent. Last week’s Indianapolis Star/WTHR poll showed the two candidates statistically tied, with Obama at 46 and McCain at 45. But the Zogby poll competed Sunday has McCain ahead by 5 points, 49 to 44 percent—roughly the same margin it found the week earlier. SurveyUSA’s last poll completed Oct. 28 shows the race tied, while Rasmussen pegs McCain’s lead at 3 points. Polls conducted since Thursday by Rasmussen, SurveyUSA and Zogby show the race tied. An Oct. 29 Politico/InsiderAdvantage poll had McCain ahead by 3 points, 50 to 47 percent. The most recent Rasmussen (Oct. 29) and Research 2000 (Oct. 28-30) polls show McCain ahead by 4 points. A Public Policy Polling survey completed Sunday had the race effectively tied, with 48-47 tilting to Obama’s favor. McCain has not held a lead in Nevada since mid-September. Sunday’s Reuters/Zogby poll showed Obama ahead 51 to 43 percent. A couple days earlier, the Las Vegas Review Journal/Mason-Dixon survey (Oct. 28-29) showed Obama leading by a slimmer 4-point margin, 47 to 43 percent, the same 4-point spread as Rasmussen’s Oct. 27 poll. The Reno Gazette-Journal poll, taken Oct. 25-28, puts Obama ahead by 5 points. The last two SurveyUSA polls peg McCain down by 7 points. The latest, conducted Oct. 29-31, shows Obama leading 52 to 45 percent. Rasmussen’s Oct. 28 poll also showed Obama comfortably ahead, 54 to 44 percent. In the past week several polls have shown McCain with the slightest lead, though always bobbing within the margin of error. Recent surveys by Rasmussen (Nov. 2), SurveyUSA (Oct. 30-Nov. 2), and Zogby (Oct. 30-Nov. 2) place McCain ahead by 1 point. Mason-Dixon (Oct. 29-30) pegs McCain ahead by 3, while the Oct. 29 Politico/InsiderAdvantage poll showed the state split evenly at 48. A recent Daily Kos/Research 2000 poll (Oct. 28-29) showed McCain ahead 47 to 46 percent. The week earlier, the same survey showed the two candidates tied. In mid September, Research 2000 showed McCain ahead by 13 points. Sunday’s Rasmussen poll showed the race exactly tied, at 49 percent each. SurveyUSA’s poll, also completed Sunday, has Obama ahead 48 to 46 percent–a statistical tie. Another recent poll (Oct. 31-Nov. 2), by Strategic Vision, shows McCain ahead by a similar margin, 48 to 46 percent. However surveys by Zogby, Quinnipiac and the Ohio Poll, also taken over the same period, have Obama ahead by 6 or 7 points. No public poll has shown McCain ahead in Pennsylvania in the general election. Still, four polls completed over the weekend show Obama ahead by 6 to 8 points–with Zogby the outlier, measuring a 14-point lead for the Democrat. McCain has not led in a public poll in the state since September. Two polls completed over the weekend, by SurveyUSA and Rasmussen, show Obama ahead by 4 points. In the same period, Zogby shows Obama ahead by 6 while Mason-Dixon estimates the Democrat’s lead at 3. Hardball: The Hot Senate Races ~ Can Dems Get To 60? One thing you could say about Karl Rove is that he is willing to face the truth ~ in this case pointing out the likely outcome of this election race. The final Rove & Co. electoral map of the 2008 election cycle points to a 338-200 Barack Obama electoral vote victory over John McCain tomorrow, the largest electoral margin since 1996.All remaining toss-up states have been allocated to the candidate leading in them, with Florida (27 EV) going to Obama, and Indiana (11 EV), Missouri (11 EV), North Carolina (15 EV), and North Dakota (3 EV) going to McCain. Has Fox News become a fascist outlet for the GOP ?? The channel puts itself across as representing the views of the Heartland – and uses vicious attacks to make its point – anyone who doesn’t agree with their point of view is deemed unpatriotic. During this election they have come out with all barrels firing – wholeheartedly hashing and rehashing – any GOP/far-right talking points which they thought would take down the other guy and help their one – often without any real focus on the issues. But if they truly represent the views of the Heart of America – why then – even after all of their efforts – their candidates, Sarah Palin and John McCain are so far behind in the polls – and instead of being in a good position to win this election – the candidates they have worked tirelessly to promote – by any means – are poised to lose – short of a perfect storm which blows these pro-Obama polls in their favor? Shame on Fox News. The e-mail, which went to a significant portion of Fox News staff, continued, comparing Obama’s eight interviews with Fox News to the five Hillary Clinton gave the network. The planned guest, Media Research Center president Brent Bozell, did appear but the segment was retooled to discuss the media coverage of Obama’s remarks on the coal industry. In the context of the 6:15 am B Block “IGNORE FNC” segment, may I point out Obama has done 5 interviews with me and one with Chris Wallace, one with Brit Hume and one with Bill O’Reilly. That’s 8 interviews. Would I like more? Yes. Would Chris Wallace? Yes. Would Brit and O’Reilly like more? Of course. But it’s still 8 interviews with FNC in this campaign. By comparison, my count is the Hillary Clinton did 5 FNC interviews with FNC during the campaign: 3 with me, one with Chris Wallace and one with O’Reilly. This does not count morning round-robins done during the primaries as those tend not to have any selectivity to them. Just a note to add some real numbers and a grain of context. Apologies if I left out any other big interview of Obama of Clinton on our network. JUAN WILLIAMS, POLITICAL ANALYST & FOX NEWS CONTRIBUTOR & JAMES T.
>> PULL SOT FROM JOE’S 8C INTV? Talk about running up the score. Florida now looms as the Democratic firewall on Election Day. Thanks to the disproportionate effect of the economic crisis on the Sunshine State, Republicans are in danger of losing the one state that could block any chances for an Electoral College victory. I firmly believe that Florida is the most representative of the nation as a whole. Presidents are more successful if they win Florida. I am impressed and moved that Barack Obama seems to understand Florida’s significance — for winning and for governing. Six of Florida’s metropolitan areas ranked in the nation’s 20 worst for foreclosures in the second quarter. Broward and Miami-Dade counties had 10,000 foreclosures last month alone. In 2004, Democrat John Kerry had 14 offices and about 100 paid staffers in Florida. This year, Obama has 60 offices and about 500 paid staffers. From May to September, McCain led in 25 of the 41 polls taken in Florida, with four ties. But since October, Obama has led in 11 of the 14 Florida polls, with seven of them outside the margin of error. From Oct. 6 to Sunday, McCain ran 5,702 TV ads in Florida’s largest markets, according to Nielsen Media Research. In the same period, Obama ran 18,909 TV ads. As he has in most states, Obama has outraised McCain in campaign contributions in Florida. But the $3 million margin, $17 million to $14 million, is among the smallest in the swing states. Florida has voted for a Democrat only once since 1980. President George W. Bush won the state by 381,000 votes four years ago. For decades, Democrats have led in voter registrations in Florida. This year, they have 650,000 more registered voters than Republicans do. That margin is nearly double the margin the party had in the 2000 and 2004 elections. About a quarter of all the state’s voters are in southeastern Florida, in Broward, Palm Beach and Miami-Dade counties. Democrats, who have a nearly 600,000-voter edge there, must win big to offset the many Republican-leaning counties elsewhere. Of the 1.2 million voters who have voted early so far, 640,000 of them are registered Democrats, compared with 361,000 registered Republicans. Historically, the GOP has led in early and absentee voting. Just days after Colorado Secretary of State Mike Coffman reached an agreement in a lawsuit filed against him for allegedly illegally purging voters from the state’s voter roll, Coffman purged an additional 146 voter records from the list. Coffman was sued by Common Cause of Colorado and two other groups who claimed the state violated the National Voter Registration Act by illegally purging some 20,000 voters from its registration list within 90 days of the general election. The plaintiffs wanted a preliminary injunction that would reinstate the purged voters and prevent the state from purging anyone else before the election. The NVRA prohibits states from purging an already-registered voter from a list during that timeframe unless a voter has died or been declared unfit to vote or notifies officials that he has moved out of state. Aside from those categories, and outside of the 90-day-timeframe, election officials must notify voters before they remove them from the voter list. Voters whose names are matched to death or convicted felon lists can be removed without notice. But voters who are suspected of having moved must be sent a notification that they may be dropped from the list. Even then, a state cannot purge the voter from the list until the voter fails to vote in two consecutive federal elections. Coffman maintained that he followed the law for purging the names of convicted felons and people who died, moved, or had duplicate records on the list. He also said only duplicate records had been purged during the 90-day period. But Linda Townsend Johnson and her husband, James Edward Johnson, testified at a hearing that they were removed erroneously within the 90-day period. After moving to Colorado in May and registering to vote, they had received confirmation of their registration as well as absentee ballots in the mail. But the state removed them from the voter list after two people signed voter registration applications in their names in September, using a different address. When the county clerk’s office sent mail to the address registered by the two people in September, it was returned. Officials then removed the Johnsons from the voter roll, in violation of the NVRA. The secretary of state also agreed to compile a complete list of every voter removed from the role since May 14 and provide it to county clerks and the plaintiffs’ lawyers. Coffman said the settlement agreement didn’t require him to stop purging voter names. He said the new purges were duplications or voters who had moved out of state or died. Half a dozen names were purged because the voter had withdrawn his registration application, was a convicted felon or wasn’t a U.S. citizen, implying that all of the 146 purges were legal cancellations under the NVRA. Nonetheless, Coffman agreed to comply with the judge’s order. The big worry is that the Republicans will attempt to steal this election. By cheating to get in George Bush – we get a lower quality candidate – or more in this election – it’s the best person to lead the country in these economic times. McCain’s view is backward looking, at best he would have made a better president back in 2000, but George W/Rove dirty tricks sealed his fate. In this election he has a person as his VP, who has been deemed unqualified to hold higher office, by the majority voting public. To steal the election – would send the wrong message to the world and put America on a course, which it may not recover from for some time. John McCain has surrounded himself with lobbyists, all lobbyist can’t be bad, but it seems that his focus will be on the interests of these lobbyist over the interests of the average American. These include oil lobbyist, of which he plans to give EXXON Mobil a tax credit – although they made record profits – over giving the poorest workers, and the middle class a tax break. The polls have indicated that people have selected Obama as the best person to steer the county on a new path, while giving high priority to the the interests of the average person who wishes to do well in America. The Republicans propped on the belief that their belief in God/ gives them priority over all others, even those believing in the same God, that this gives them the right to cheat, steal, lie, smear, deceive and manipulate to win an election, by any means, disenfranchising those honest voters, and making a mockery out of the democratic system. Republicans, don’t need to steal this election, what they need, is to steal away and rethink what it means to be Republican – not the racist, hateful, bigoted bag of tricks they have been promoting, not the war mongering blinded by addiction to oil and obtaining the next fix by military means strategy, but a meaningful this is who we are, this is how we want to present ourselves and here’s what we hope to achieve or how we think we might do it better. Alternatively maybe they should select who among them would like to go to prison – for their larger supremacist goal. WASHINGTON (AFP) – Barack Obama’s campaign said Democratic voters were piling up imposing early voting totals in battleground states, warning that John McCain must win big on election day on Tuesday to catch up. “The die is being cast as we speak,” Obama’s campaign manager David Plouffe said in a conference call with reporters, saying the Democrat was running strong in swing states Florida, Colorado, New Mexico and others. “So Senator McCain, on election day is going to have to not just carry the day but carry it convincingly,” Plouffe said. Plouffe also said that the campaign would expand its advertising in the frenetic final days of the campaign into Republican McCain’s home state of Arizona, following polls which suggest the race had tightened there. The campaign would also take out advertising spots over the final weekend in normally Republican states like Georgia, after being encouraged by early voting figures and North Dakota, he said. Plouffe said that in the crucial swing-state of Florida, Democrats had built a 200,000 strong gap over McCain after early and absentee voting — reversing the trend from 2004 when President George W. Bush beat John Kerry in the state. “In 2008, as of last night, we had just about a 200,000 vote edge over the Republicans, which is, obviously, a big change from 2004,” Plouffe said. Republicans went into election day that year with an edge of around 40,000 votes. In the western swing state of Nevada, 43 percent of Democrats who voted early were either new voters or sporadic voters — a prized demographic as campaigns seek an edge in close fought states, Plouffe said. In North Carolina, Plouffe said, 19 percent of Democrats who voted early had never voted in a general election before, bolstering Obama’s hopes of bringing large numbers of new voters into the process. The McCain campaign scheduled its own conference call later on Friday to address the state of the race, four days before election day. “The pundits have written us off much as they have done before, but we are closing my friends, and we are going to win Ohio,” McCain said in the crucial midwestern battleground state on Friday. Information technology expert Stephen Spoonamore believes this architecture could have made possible a KingPin or “Man in the Middle” (MIM) attack — a well-defined criminal methodology in which a computer is inserted into the network of a bank or credit card processor to intercept and modify transactions before they reach a central computer. 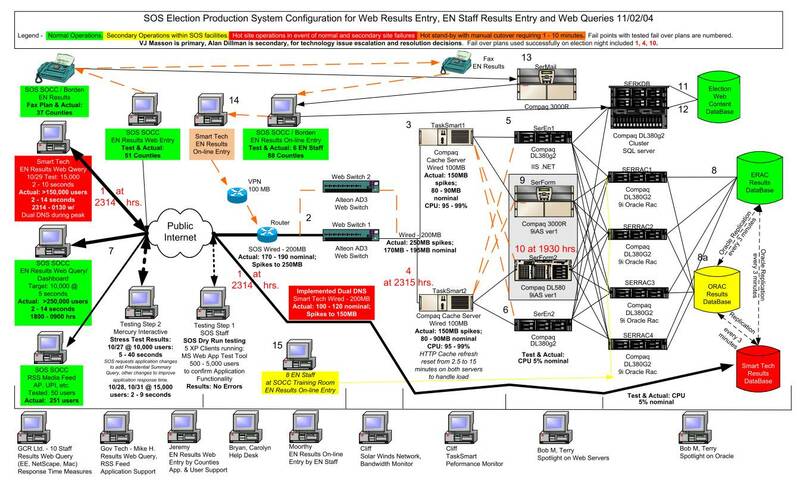 Spoonamore has now filed a fresh affidavit (pdf), in regard to a case involving alleged Ohio vote tampering, which asserts that the schematics support a “Man in the Middle” attack having been implemented in Ohio in 2004. Ohio provided the crucial Electoral College votes to secure President George W. Bush’s reelection. “The computer system at SmartTech had the correct placement, connectivity, and computer experts necessary to change the election in any manner desired by the controllers of the SmartTech computers,” Spoonamore wrote in the affadavit. Dill told Raw Story the schematics are inconclusive and that he continues to have questions after reading Spoonamore’s latest affadavit, although he cautioned that he himself is not an expert in Spoonamore’s specialty of network security. 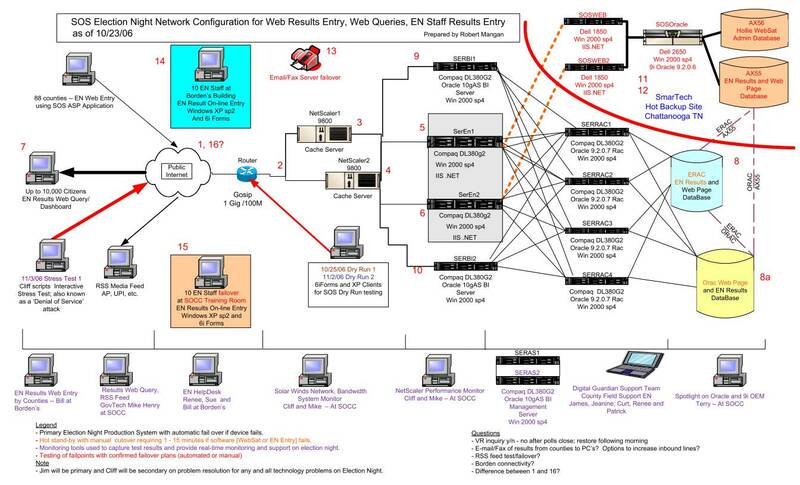 RAW STORY has posted the schematics here for 2004 and for 2006 see below. Spoonamore notes that on election night in 2004, he observed what he calls the “Connally anomaly,” in which eight Ohio counties that had been reporting a consistent ratio of Kerry votes to Bush votes suddenly changed at about 11 pm and began reporting results much more favorable to Bush. Election tallies in these counties, plus a few others, also showed the unlikely result of tens of thousands of voters choosing an extremely liberal judicial candidate but not voting for Kerry. Spoonamore immediately suspected that a Man in the Middle attack had occurred but had no idea how it could have been carried out. It was not until November 2006 that the alternative media group ePluribus Media discovered that the real-time election results streamed by the office of Ohio’s Secretary of State at election.sos.state.oh.us had been hosted on SmarTech’s servers in Tennessee. “Since early this decade, top Internet ‘gurus’ in Ohio have been coordinating web services with their GOP counterparts in Chattanooga, wiring up a major hub that in 2004, first served as a conduit for Ohio’s live election night results,” researchers at ePluribus Media wrote. Check out CNN’s Electoral Map. (CNN) — Some tough news for John McCain in his own backyard, as his home state of Arizona moves from “safe McCain” to “lean McCain” in the latest CNN poll of polls. And the Republican nominee continues to lose ground in reliably-red areas, as North Dakota moves from “lean McCain” to “toss-up” – meaning three electoral votes that had been counted for McCain are now considered up for grabs. But there’s some good news for McCain down south: Louisiana has moved from “lean McCain” to “safe McCain.” And the movement on the map is far from done. Barack Obama now leads McCain by 131 electoral votes, up from his 128-vote lead yesterday. CNN now estimates that if the presidential election were held today, Obama would win 291 electoral votes and John McCain 160. There are 87 electoral votes up for grabs. Again, 270 electoral votes are needed to win the White House. The CNN Electoral Map is based on analysis from the CNN Political Unit and takes into account a number of factors, including polling, state voting trends, ad spending patterns, candidate visits, and guidance from the campaigns, parties, and political strategists. The list will be updated regularly as the campaign develops over time. So has John McCain’s big play for Pennsylvania, where he’s hoping to poach 21 electoral votes out of the Democratic column, been paying off in the opinion polls? The answer: Not in any way to speak of — even though McCain and Palin have have each visited the state many times in the last two weeks, and Palin is herself spending all of today there. McCain’s own level of support has recovered somewhat from a deep hole he was in weeks ago — when the economic crisis hit, he was down by as much as 15 points — but his gains haven’t significantly weakened Barack Obama’s position. McCain has simply grabbed back some of his lost support from the undecided column, but Obama hasn’t actually lost much from what he gained during the same period. Only two polls in the last week, from Mason-Dixon and Strategic Vision (R), have put Obama below 50% support, while most others have him above that key level. For example, CNN has Obama up 55%-43%, and the local college Franklin & Marshall has him up 53%-40%. Obama should still be expected to score a decent-sized victory here, unless the polls turn out to be drastically wrong or show a dramatic swing to McCain in the next few days. A new Pew Research poll shows Sen. Barack Obama holds his widest national margin yet over Sen. John McCain, 53% to 39%, among likely voters. Pew interviewed 2,599 registered voters on both landline phones and cell phones. As voters have gotten to know Senator Barack Obama, they have warmed up to him, with more than half, 53 percent, now saying they have a favorable impression of him and 33 percent saying they have an unfavorable view. But as voters have gotten to know Senator John McCain, they have not warmed, with only 36 percent of voters saying they view him favorably while 45 percent view him unfavorably. Even voters who are planning to vote for Mr. McCain say their enthusiasm has waned. In New York Times and CBS News polls conducted with the same respondents before the first presidential debate and again after the last debate, Mr. McCain made no progress in appealing to voters on a personal level, and he and his running mate, Gov. Sarah Palin, had alienated some voters. Mr. Obama’s favorability is the highest for a presidential candidate running for a first term in the last 28 years of Times/CBS polls. Personal appeal is an intangible element in voters’ decisions. Each voter has a personal reason for connecting with a candidate or not. But the percentage of those who hold a favorable opinion of Mr. Obama is up 10 points since last month. Opinion of Senator Joseph R. Biden Jr., Mr. Obama’s running mate, is also up, to 50 percent last weekend from 36 percent in September. In contrast, favorable opinion of Mr. McCain remained stable, and unfavorable opinion rose to 45 percent now from 35 percent in September. Mrs. Palin’s negatives are up, to 41 percent now from 29 percent in September. Mr. McCain made no progress in appealing to voters on a personal level, and he and his running mate, Gov. Sarah Palin, had alienated some voters. Mr. Obama’s favorability is the highest for a presidential candidate running for a first term in the last 28 years of Times/CBS polls. Mrs. Palin’s negative rating is the highest for a vice-presidential candidate as measured by The Times and CBS News. Even Dan Quayle, with whom Mrs. Palin is often compared because of her age and inexperience on the national scene, was not viewed as negatively in the 1988 campaign. The nationwide telephone poll was conducted Sept. 21-24, with re-interviews completed Friday through Sunday of 518 adults, 476 of whom are registered voters. The margin of sampling error is plus or minus five percentage points for all adults and voters. Of those who said their opinion of Mr. McCain had been tarnished, many cited his attacks on his opponent, the choice of Ms. Palin as his running mate and his debate performance. Among the voters who said their opinion of Mr. Obama had improved, many cited his debate performance, saying they liked his calm demeanor and the way he had handled the attacks on him from the McCain campaign. Some voters in the latest New York Times/CBS News poll were disappointed by John McCain’s attacks and running mate choice. The poll found Barack Obama was supported by majorities of men and independents. After several weeks in which the McCain campaign unleashed a series of strong political attacks on Mr. Obama, trying to tie him to a former 1960s radical, among other things, the poll found that more voters see Mr. McCain as waging a negative campaign than Mr. Obama. Six in 10 voters surveyed said that Mr. McCain had spent more time attacking Mr. Obama than explaining what he would do as president; by about the same number, voters said Mr. Obama was spending more of his time explaining than attacking. Over all, the poll found that if the election were held today, 53 percent of those determined to be probable voters said they would vote for Mr. Obama and 39 percent said they would vote for Mr. McCain. The findings come as the race enters its final three weeks, with the two candidates scheduled to hold their third and last debate on Wednesday night, and as separate polls in critical swing states that could decide the election give Mr. Obama a growing edge. But wide gaps in polls have historically tended to narrow in the closing weeks of the race. Voters who said their opinions of Mr. Obama had changed recently were twice as likely to say they had grown more favorable as to say they had worsened. And voters who said that their views of Mr. McCain had changed were three times more likely to say that they had worsened than to say they had improved. The top reasons cited by those who said they thought less of Mr. McCain were his recent attacks and his choice of Gov. 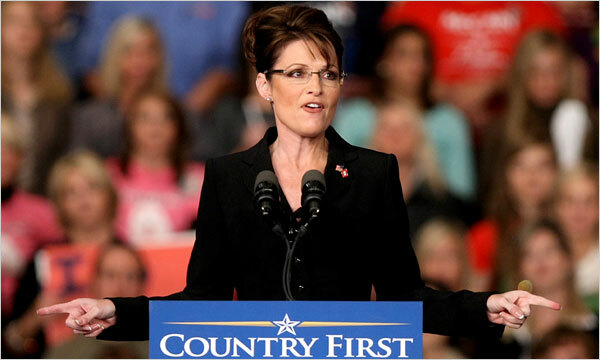 Sarah Palin of Alaska as his running mate. (The vast majority said their opinions of Mr. Obama of Illinois, the Democratic nominee, and Mr. McCain of Arizona, the Republican nominee, had remained unchanged in recent weeks.) But in recent days, Mr. McCain and Ms. Palin have scaled back their attacks on Mr. Obama, although Mr. McCain suggested he might aggressively take on Mr. Obama in Wednesday’s debate. With the election unfolding against the backdrop of an extraordinary economic crisis, a lack of confidence in government, and two wars, the survey described a very inhospitable environment for any Republican to run for office. More than 8 in 10 Americans do not trust the government to do what is right, the highest ever recorded in a Times/CBS News poll. And Mr. McCain is trying to keep the White House in Republican hands at a time when President Bush’s job approval rating is at 24 percent, hovering near its historic low. 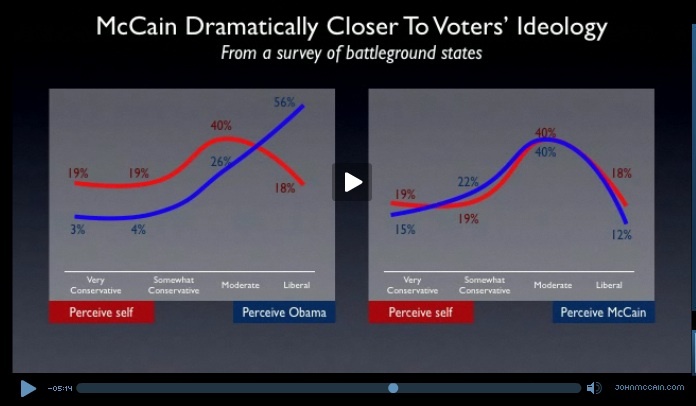 While the poll showed Mr. Obama with a 14 percentage-point lead among likely voters in a head-to-head matchup with Mr. McCain, when Ralph Nader and Bob Barr, the Libertarian candidate, were included in the question, the race narrowed slightly, with 51 percent of those surveyed saying that they were supporting Mr. Obama and 39 percent supporting Mr. McCain, with Mr. Nader getting the support of 3 percent and Mr. Barr 1 percent. Other national polls have shown Mr. Obama ahead by a smaller margin. The poll suggested that the overwhelming anxiety about the economy and distrust of government have created a potentially poisonous atmosphere for members of Congress. Only 43 percent of those surveyed said that they approved of their own representative’s job performance, which is considerably lower than approval ratings have been at other times of historic discontent. By way of comparison, just before the Democrats lost control of Congress in 1994, 56 percent of those polled said that they approved of the job their representative was doing. And after nearly eight years of increasingly unpopular Republican rule in the White House, 52 percent of those polled said that they held a favorable view of the Democratic Party, compared with 37 percent who said they held a favorable view of the Republican Party. Voters said they preferred Democrats to Republicans when it came to questions about who would better handle the issues that are of the greatest concern to voters — including the economy, health care and the war in Iraq. The nationwide telephone poll was conducted Friday through Monday with 1,070 adults, of whom 972 were registered voters, and it has a margin of sampling error of plus or minus three percentage points for both groups. After several weeks in which the McCain campaign sought to tie Mr. Obama to William Ayers, a founder of the Weather Underground terrorism group, 64 percent of voters said that they had either read or heard something about the subject. But a majority said they were not bothered by Mr. Obama’s background or past associations. Several people said in follow-up interviews that they felt that Mr. McCain’s attacks on Mr. Obama were too rooted in the past, or too unconnected to the nation’s major problems. The poll found that Mr. Obama is now supported by majorities of men and independents, two groups that he has been fighting to win over. And the poll found, for the first time, that white voters are just about evenly divided between Mr. McCain and Mr. Obama, who, if elected, would be the first black president. The poll found that Mr. Obama is supported by 45 percent of white voters — a greater percentage than has voted for Democrats in recent presidential elections, according to exit polls. Mr. McCain was viewed unfavorably by 41 percent of voters, and favorably by 36 percent. Ms. Palin’s favorability rating is now 32 percent, down 8 points from last month, and her unfavorable rating climbed nine percentage points to 41 percent. Mr. Obama’s favorability rating, by contrast, is now at 50 percent, the highest recorded for him thus far by The Times and CBS News. There were still some strong findings for Mr. McCain. Sixty-four percent of voters polled said Mr. McCain, 72, was well-prepared for the presidency, which has been a central theme of his campaign. Fifty-one percent said Mr. Obama, 47, was. But roughly 7 in 10 voters said Mr. Obama had the right kind of temperament and personality to be president; just over half said the same of Mr. McCain. Mr. Obama’s supporters continued to be more enthusiastic about him than Mr. McCain’s supporters, the poll found, and more of those surveyed said they had confidence in Mr. Obama than in Mr. McCain to make the right decisions about the economy and health care. And while more than 6 in 10 said Mr. Obama understood the needs and problems of people like them, more than half said Mr. McCain did not. The black guy can’t win. The black guy with the middle name “Hussein” can’t win. The black guy with the middle name “Hussein” who has “most liberal voting record” in the Senate just can’t win. So if and when the terrorist-loving, radical ideology-embracing, “he doesn’t see America like you and I see America” skinny black guy from Chicago wins the presidency, the only logical explanation is that he stole it. As McCain’s numbers having nose-dived in the last week, some Republicans have dived head-first into the realm of conspiracy theories in order to sow the seeds of speculation that Democrats are going to “steal” this election. This week has provided some news items which they are using as kinder for their tinfoil bonfire. ACORN (the Association of Community Organizations for Reform Now), is an organization which has been registering voters in low-income areas. Volunteers at some chapters (who are paid per registration) have been found guilty of submitting to ACORN fake voter registrations. That, obviously, is a crime. ACORN is obligated by law to turn over all voter registration forms, even the fake ones, but it flags those it believes are suspicious (Mickey Mouse, John Q. Public, etc.) While the why of the situation remains unclear, ACORN’s Nevada office was raided this week in connection with a voter registration fraud probe. The key distinction here is between voter fraud and voter registration fraud, one of which is truly dangerous, the other a petty crime. The former would be, say, voting the cemeteries or stuffing the ballot boxes. This has happened occasionally in American history, though I can think of recent instances only in rare local races. Practically speaking, this can most easily be done by whoever is actually administering the election, which is why partisan observers carefully oversee the vote-counting process. The latter is putting the names of fake voters on the rolls, something that happens primarily when organizations, like Acorn, pay contractors for new voter registrations. That can be a crime, and it messes up the voter files, but there’s virtually no evidence these imaginary people then vote in November. The current stories about Acorn don’t even allege a plan to affect the November vote. Republicans are pushing the irrational theory that Democrats are “cheating” their way to the White House because for them, the real reason for a possible Republican defeat would be irrational. In this atmosphere, maybe having a “liberal” president who favors reasonable regulation and stringent oversight isn’t a bad thing after all. But that screencap is from many months ago, before the full brunt of the failure of conservative policies has come to the foreground with the resounding “thud” of a stock market collapse. In this atmosphere, maybe having a “liberal” president who favors reasonable regulation and stringent oversight isn’t a bad thing after all. And maybe, when voters are worried about how to pay for health care, voting for the Republican who touts the ability of the “market” to deal with the problem doesn’t seem that appealing anymore. And maybe, when voters are worried about how to pay for health care, voting for the Republican who touts the ability of the “market” to deal with the problem doesn’t seem that appealing anymore. The middle class is being cheated. And they know–as much as Republicans would like for them to forget–which party has been in power for the last eight years. And as they flock to a candidate who promises them change from failed Republican policies, panicked Republicans flock to conspiracy theories. Blaming a possible Democratic victory on “voter fraud” is much easier than acknowledging that a resounding Democratic victory would be a wholesale rejection of Republican governance. And it’s easier than admitting that voters–yes, Senator Graham, maybe even voters in Indiana and North Carolina–like what the liberal black guy from Chicago is saying about the middle class. So let them wrap themselves in tin foil. Let them revel in nuttery now. They can use that tin foil to wipe their eyes if and when–as the polls suggest–they will be wallowing in defeat in November. PRINCETON, NJ — The latest Gallup Poll Daily tracking report shows Barack Obama with a 52% to 41% lead over John McCain. Nearly all interviews in today’s report were conducted before Tuesday night’s town hall style debate in Nashville. Any movement in voter preferences as a result of this debate will be apparent in coming days. Voter preferences seem to have stabilized for the moment, as Obama has held a double-digit lead over McCain in each of the last three individual nights of polling. The general-election results are based on combined data from Oct. 5-7, 2008. For results based on this sample of 2,747 registered voters, the maximum margin of sampling error is ±2 percentage points.